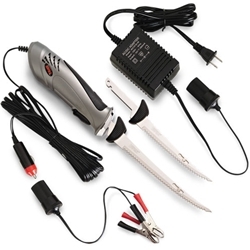 The Rapala Deluxe Electric Fillet Knife Set works wherever you are. This Electric Knife has a powerful and quiet motor which makes fast and effortless work of any filleting chore. Plug into any wall outlet, connect to trolling motor battery posts or plug into car or boat lighter outlet for full filleting power. Everything fits neatly into conventient travel case. With this complete Rapala Deluxe Electric Fillet Knife Set, it's like a shortcut to the frying pan!